Learning business strategies and tools excites me. Just saying that to some of my friends would literally make them yarn. The thought of listening to a one hour podcast on marketing, reading multiple blog articles a week, or geeking out on the latest app makes their brains hurt. 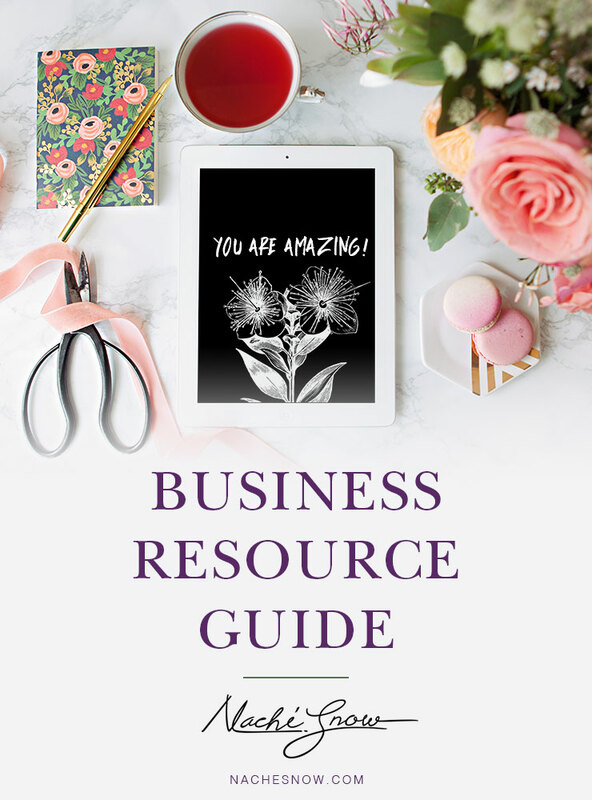 This page is for those who love business resources and for those who need it. The nerds can geek out on all that’s listed where as those who need help in a specific area can find resources that work for them. Some companies appear in multiple categories because they are well known for both (and I don’t want you to overlook them). NOTE: This is not an exhaustive list of every resource for every category. I’ve listed companies and brands that I’ve used personally or that entrepreneurs I trust recommend over and over again. Do your research and let me know if you recommend them to. I will continue to update this page as I find items, but subscribe to the newsletter to be the first to know about my finds. Clients are able to book a time and pay for their appointment or package seamlessly. The software also integrates with PayPal, ConvertKit, Google Calendar and several other popular apps. A ton of podcasters recommend this company. Great for service based business. They charge a monthly fee. Their motto is pay once and use for ever. The software resides on your web server. The alternative to Quickbooks. They charge a monthly fee. For inspiration check out my business card board on Pinterest. They are a pricier card, but you get what you pay for. If you want quality paper and a good print you need to check them out. Sign up for their newsletter to get notified about coupons or free shipping. They also have other printed products. T prices? Try Vista or Overnight Prints. I’ve never tried them, but have admired their work on Pinterest. They create letterpress business cards. I may get some printed for nachesnow.com. I think the botanical illustrates will look amazing letter pressed. I use this for the majority of my email lists. It’s easy to use and gets the job done. Best of all, it’s free if you’re under so many users! Gaining popularity. I’m using it for nachesnow.com. This is for when you’re ready to level up your game base monthly price is $29. I’ve used this a couple of times. It’s ok, not as user friendly as I would like…but it’s free. I’ve used forms on other sites that use Typeform. The forms are beautiful. Also, if you pay for the premium account you can add some logic. All the business podcasters and their guest swear by this. If you’re trying to sell a course, product or whatever supposedly it will help you land the sell. Receive and sign contracts digitally and securely. Get incorporated, register trademarks, etc. Some people go to a lawyer, some do it themselves, others go to Legal Zoom. It just depends on what you need. I am currently trying this out for nachesnow.com. So far so good. They offer a free 15 day trial and their paid plans start at $30. It syncs seamlessly with WordPress and every time I create a post I schedule out all of my social media for it. It also, for an extra fee, will automatically repost your items for you. I’ve used Hootsuite for several sites to manage Facebook and Twitter. I haven’t tried the Instagram featured yet. I’ve never used buffer, but a lot of bloggers recommend it. I’m a prime member so I shop on Amazon for almost everything! But I am constantly comparing prices. They sale clear bags and other shipping material. I’ve used them a couple of times in the past. They offer custom packing supplies for small businesses. I’ve ordered a self inking stamp and custom tape from them. They have all kind of shipping containers. I’ve used them several times. Integrates with the most popular commerce sites. You can import, manage and ship order from their site. If my order increase significantly on CreativeRoute.com I will start using them. I’ve used Uline several times to purchase packaging. These tools are great for vendors and store owners. See accounting and invoicing if you’re a consultant, coach, etc. Tool for wellness professionals. Feature are marketing, point of sale, calendar, staff resources, reports, and automation. I heart PayPal. I’ve used it for YEARS to collect payments from friends, family, and customers. It will also allow you to invoice. See below under website builder for more information. It is very easy to collect payment. You can build a Shopify site or use their plugin for WordPress. I’ve never used it, but it’s popular. I’ve used Square in the past. This is also a huge favorite with small business. Managing clients, interviews, or other appointments? Check them out. The interface is beautiful and it’s easy to use. Lots of folks swear by this. It helps you automate tasks and organize projects. From managing blog content to social media plan. Tool for wellness professionals. Features are marketing, point of sale, calendar, staff resources, reports, and automation. Track and communicate with your team in one place. Organize projects and have internal communications in one place.